Using a t30 "torx" driver, loosen the 2 screws until the groove along each screw circumference catches on the screw case. 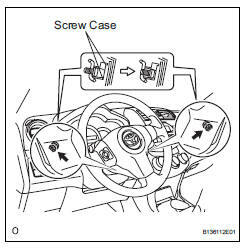 Pull out the steering pad from the steering wheel and support the steering pad with one hand as shown in the illustration. When removing the steering pad, do not pull the airbag wire harness. 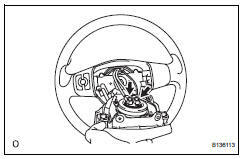 Using a screwdriver, disconnect the 2 airbag connectors. Disconnect the horn connector and remove the steering pad.